Installing new siding can be extremely rewarding, but it is a big decision. However, it’s one that’s well worth it once you see how this upgrade can transform the exterior of your home and boost its curb appeal. But, of course, you want to make sure that you’re selecting the right type of siding that provides your home not only with beauty, but also protection against the elements and durability. At Colorado Siding, we carry numerous options of siding materials, styles, and colors that make it easy for you to customize your home exactly the way you like it. From trendy, stylish looks to classic, versatile siding and trim combinations, we have the perfect exterior enhancements for homes of all types and personalities. 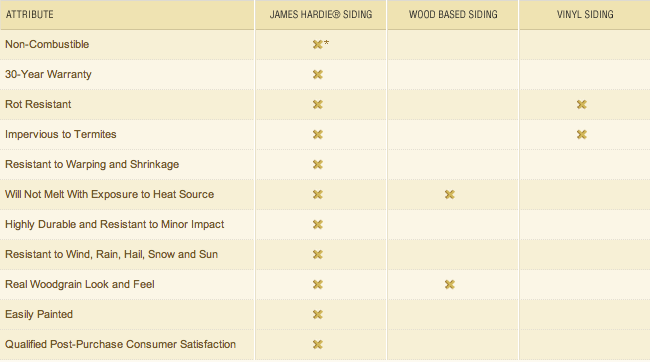 To gain an idea of how well different siding materials perform in Denver’s climate, we encourage you to take a look at the chart below!